The Silence of the Stones – Released after 30 years wrongful imprisonment – missing children, perjury and revenge. What is the truth and who is lying? Touching the Wire – The women of Auschwitz and a man who tried to save them – a fictional tale inspired by a terrible truth. Can a promise made to a lost love be kept? Where Hope Dares – Kidnapped to fulfil an ancient prophecy. Abe must choose. His friends’ lives or mankind’s immortal souls? FOR THEIR COUNTRY’S GOOD TRILOGY – A young poacher is exiled to Van Diemen’s Land, leaving behind his common-law wife. Pregnant and penniless, and determined her child shall know its father, she embarks on a perilous endeavour to follow the man she loves but at what cost? The Dandelion Clock – My latest release – The war to end all wars – a wish to end all wishes. Two young lovers are torn apart by The Great War and nothing will ever be the same again. Available now to commemorate the 100th anniversary of the end of WW1. And coming soon, Kindred and Affinity – set in 19th century England – when the man you love marries the sister you hate. 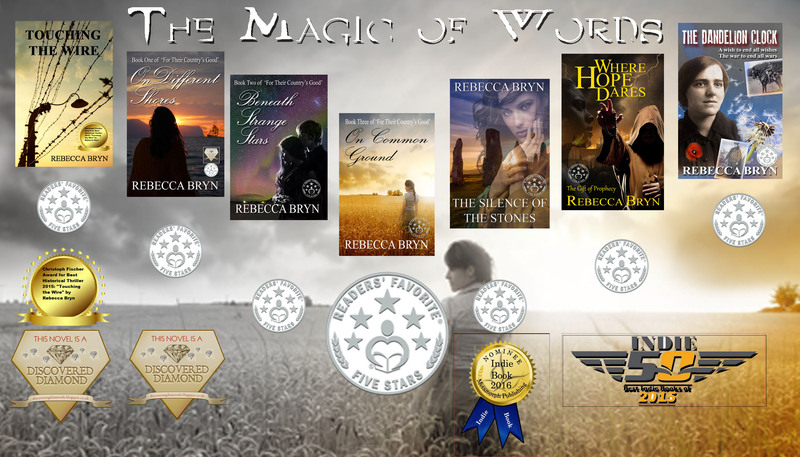 Please follow me at https://www.bookbub.com/authors/rebecca-bryn-5527e97a-146a-49e7-95c7-a30b0f603c80 for reviews and recommendations.